Home » General Interest » Are You a Luddite? If you’re not familiar with this expression then I just need to say, No … it’s not a sect or new religion or even an alien race from Star Trek. A Luddite is someone who opposes the introduction of new technology, especially into a place of work. We use it today to label a person who is stubborn, ignorant or opposed to new technology and refuses to use it. However that’s not the original meaning at all. In this article we look at the origin of the Luddite movement and the genesis of this term. The origin of term is every bit surprising as it’s name, given that it was given to people who, over 200 years ago, burned down mills in the name of a mythical character called “Ludd”. In the midst of the British industrial revolution, skilled textile workers feared for their jobs. An uprising began in 1811 when Nottinghamshire weavers attacked the new automated looms that were replacing them. The workers took inspiration from a fabled General Ludd or King Ludd living in Sherwood Forest. His fanciful name may have come from a young Leicestershire weaver called Ned Lud, who in the late 18th Century was rumoured to have smashed two stocking frames. The machine breaking spread to West Yorkshire wool workers and Lancashire cotton mills. A kind of ‘collective bargaining by riot’ seems to have spread across the textile workforce. 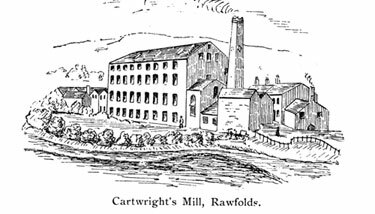 Machinery was wrecked, mills were burned down and the Luddites fought pitched battles with the British Army. The response was swift and brutal. Machine breaking became a capital offence. At trials in York, 17 Luddites were hanged and another 25 transported to Australia, while in Lancaster 8 were hanged and 38 sentenced to transportation. Trade unions had been banned in 1800 and whilst, no doubt, the destcruction of machinary had been going on for years, what marks the Luddites out was that they were better organised than their predecessors. Our modern use of the term “Luddite” is wrong. We use is to refer to someone who is ignorant or stubborn about adopting or using new technology when what the original Luddites were protesting about was that the new technology was going to cut their wages. They weren’t against the new machines per se.